It’s the most fun you can have on four wheels, ah, make that three wheels. 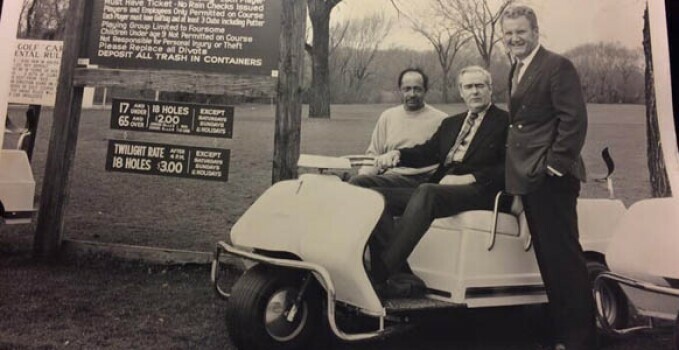 George Dunne, Frank Stein and Lorenzo Carson pose for a photo in 1972 while introducing the very first motorized golf cart to Indian Boundary Golf Course. Fifty-two years after the widely popular Northside Chicago course opened, local golfers were cruising down the fairways in these stylish people movers. No windshield, no wheel, no problem! Special thanks to Facebook user Marcelo Vargas for sharing this amazing photo with us! And hey, check out those rates! 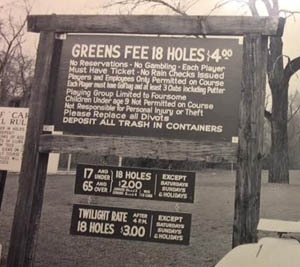 Eighteen holes for $4 … twilight rounds starting at $3. When’s the next Throwback Thursday featuring 1972 prices?! Sign us up! Check out more pictures on Indian Boundary’s Facebook page. May 1st is almost here, sign up your team today! No such thing as Monday blues when you're on the golf course while giving.